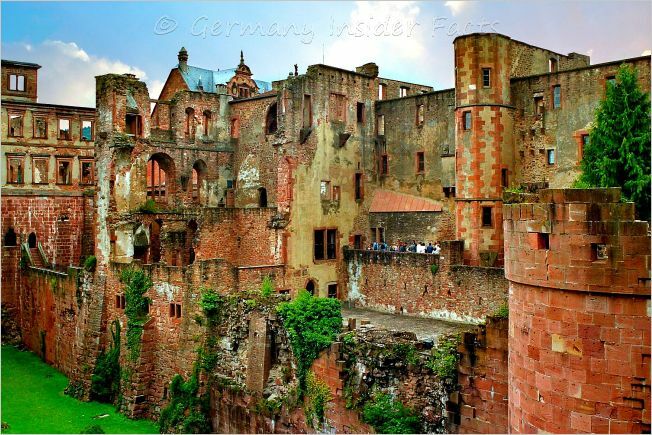 Heidelberg Castle is definitely the most popular castle ruin in Germany. 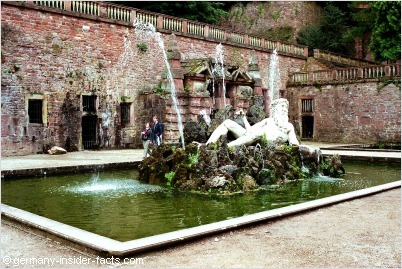 The majestic palace sits prominently on a hill overlooking historic Heidelberg. Schloss Heidelberg has inspired poets for centuries, no wonder it is a huge tourist attraction and well known around the world. Located on a spur called Jettenbühl on the northern slope of the Königstuhl mountain, visitors can enjoy the most splendid views over the Neckar valley, and to the old town of Heidelberg. 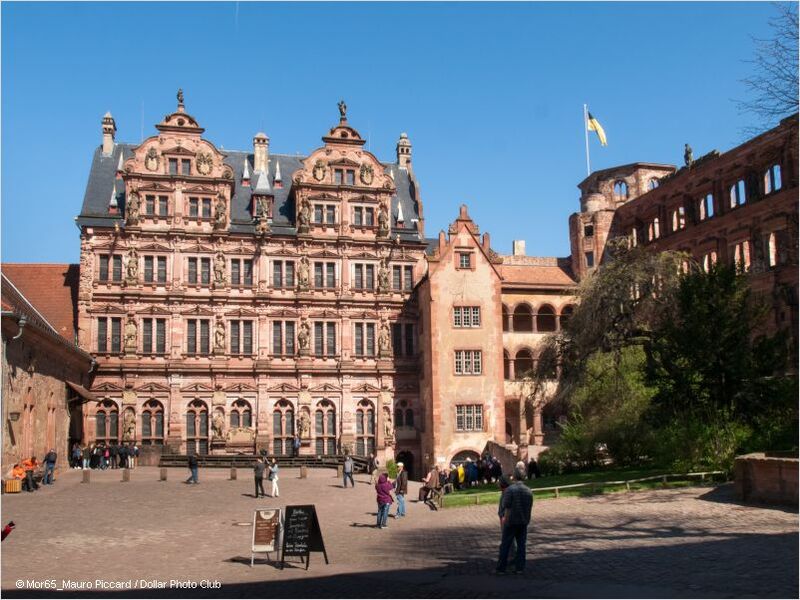 Let me show you around Heidelberg Castle, tell about its history, and give you tips how to visit the magnificient palace that is known as Schloss Heidelberg in Germany. I am sure after your visit, you will also sing "Ich hab' mein Herz in Heidelberg verloren..." (I've lost my heart in Heidelberg). A castle on the hill above Heidelberg was first mentioned in the early 13th century. Around 1300 there were even 2 castles mentioned. However, it was not until 1400 that building activities were documented. Heidelberg palace was built and extended over three centuries in different styles (Gothic and Renaissance elements). You can clearly see that in the picture above. 1556 - Ottheinrichsbau was the first German Renaissance palace. 1601 - Friedrichsbau and 1614 - English Bau, two large residential buildings were erected. 1610 - The beautiful Palace Gardens (Hortus Palatinus) were layd out by architect Salomon de Caus. The multi-level terraced gardens became famous for landscaping and horticultural techniques and design. The Thirty Years War (1618 - 1648) marks the end of the construction period. It was the first time that guns were raised against the castle. 1688-1697, during the	war of succession, the castle was destroyed twice by the French. Rebuilding began immediately each time, but reconstruction was never completed. 1764 - Still in the rebuilding phase, lightning caused a major fire and destruction. The palace decayed. Heidelberg citizen even used the ruin as a source of building materials for their own houses. Around 1800 - The ruins became an object of Romantic enthusiasm. For many artists, the ruins, the surrounding hills and the river were a perfect ensemble. 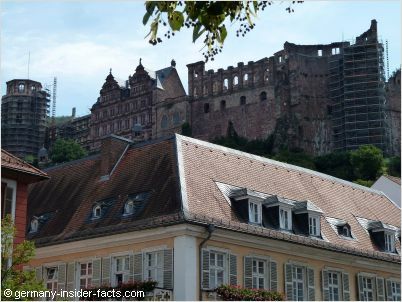 1810 - French Charles Graf von Graimberg initiated the preservation of Heidelberg Castle. 1897-1900 - After long discussions whether the castle should be restored it was decided to preserve the complex. Only the Friedrichsbau, which was not completely destroyed, was restored. The Heidelberg Tun is the world's biggest wine barrel that holds 220,000 litres (58,100 U.S. gallons). The vat (Fass) was built in 1751. The German Pharmacy Museum (Deutsches Apothekenmuseum) in the Ottheinrichsbau displays a large collection of old stuff used in a pharmacy in earlier times. You can get married at the palace. Really! From February to December you can arrange a civil wedding ceremony at Heidelberg castle. Don't forget to walk around the gardens and enjoy the beautiful views over Heidelberg and the Neckar. There are some excellent vantage points you shouldn't miss. It is easy to spend an entire day at the palace. There are two restaurants that invite you to relax after you are done with the sightseeing, and of course, you can join a wine tasting. 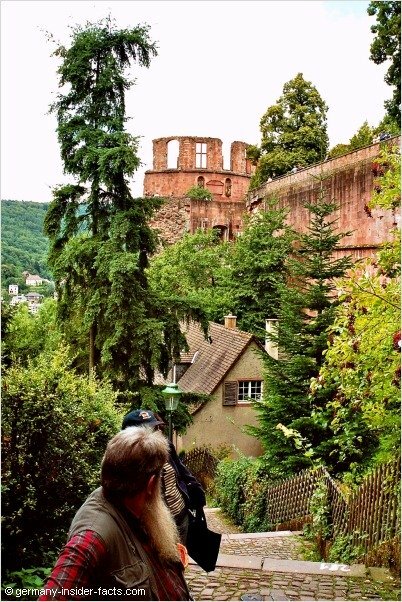 How to get to Schloss Heidelberg? Heidelberg can be easily reached by car and train. Guided tours to Heidelberg castle are available from Frankfurt. The closest motorway (Autobahn) is the A5, use the exit Heidelberg and follow the signs to the "Zentrum", or "Stadtmitte". You can't drive up to the castle, as there are rarely parking spots available. Parking in the streets around the castle is mostly reserved to residents. The next ICE train station is in Mannheim with connections from and to Munich, Stuttgart, Frankfurt, Berlin and other major cities. S-Bahn and regional express trains run frequently from Mannheim to Heidelberg and take about 15 to 20 minutes. Read more in my train travel guide when you plan a journey by rail. 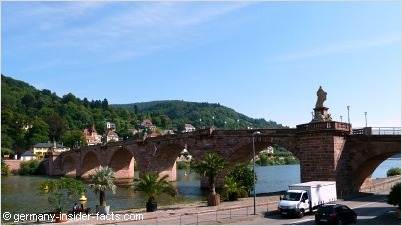 A shuttle bus runs from Frankfurt airport to Heidelberg and drops passengers off at the Crowne Plaza in Heidelberg. This is a very convenient way to travel with lots of luggage. The bus starts about every 60 to 90 minutes in both directions. Travellers with a Lufthansa flight ticket get a discount, but the service is open to everyone. How to get up to the castle? 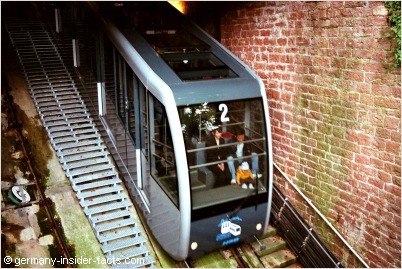 Once you arrive in the "Old Town", you have the choice of walking or taking the funicular (Bergbahn) to the castle. Watch out for the car park P12 at the "Kornmarkt. From here you can either walk, or take the short ride on the funucular. The first stop is already Heidelberg castle. Don't try to drive up to the castle, it will be hard to get a parking spot as these are reserved to the locals who live around the castle. It is a scenic way to walk up to the castle, either on a steep and winding road, or on a small staircase with 315 steps. You don't have to count the steps as you walk up, each step has a number on it to show you your progress. I admit, it was a bit strenuous. The main tourist information centre is at the train station, there is another one in the town hall. Since 2012 there is a new visitor centre at the castle grounds. The centre includes a shop, toilets, te ticket sales desk and a rest area. You can get a combi ticket, which includes a ride with the funicular, entrance fees for the palace courtyard, the big barrel and the pharmacy museum, for 7 Euro. You can only visit the interior of the palace when you book a guided tour. Tours (available in German & English ) cost a supplement of 5 Euro, tours run several times a day. You don't need to starve when you visit Schloss Heidelberg. Scharffs Schlossweinstube, a magnificent gourmet restaurant, is open from Thursday to Monday from 6pm for dinner, and on Sundays from 12am. Local dishes & snacks are available at the Backhaus, while the Fasskeller invites for wine tasting. Schloss Heidelberg is truly a special place to celebrate a huge event. You can book private and business functions at the castle. You can get married (civil & church wedding) the Schloss and celebrate afterwards in a magnificient ambience. The Ottheinrichsbau, Königssaal and other rooms can be rented for your function. Catering is offered through the Scharffs Schlossweinstube. 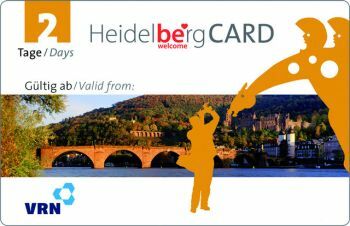 Have fun and enjoy your visit at Heidelberg Castle. This tour leaves Frankfurt in the morning for an one hour drive to romantic Heidelberg. You will visit the castle, see the wine barrel and have time to stroll around the old town. Don't miss the fantastic views from the Karl Theodor Neckar bridge. You know what it is like when you do sightseeing, the Euros for different attractions add up. With this card you can save a lot of money. 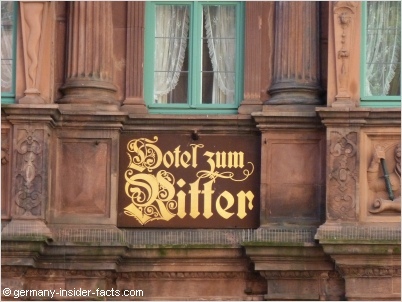 When you are looking for a bed after walking up the 315 steps to the castle, I am sure you will find a nice hotel in Heidelberg. Use the search box below to find a great deal from HotelsCombined. If you enjoyed this page, you might want to visit my other castle pages as well. Disclosure: germany-insider-facts.com is not a tour operator. I do research companies with useful tours I can offer to you. So, some links on this page are affiliate links. This means when you book a tour through one of these links, I earn a small commission (there is no extra cost for you). This money helps me to maintain this website and provide the free information. When you are interested in a tour, you make the booking on the provider's website. Be sure to read all details before you book. Of course, I would like your feedback, good or bad experiences with a tour. Click here to contact me. Thank you for supporting this website.